"It's All about the Magic of Cigars-Coffee, Wine, and Chess Compatible..."
Do you believe in Magic! The idea behind Cigarpoet affirmations was to inspire and promote the inner potential of creativity within us through the art of poetry,self empowerment, and the power of thought. My motto is "Learn to Paint and Create Your Reality". There are many pathways to reach our own personal development, and it is different for each of us. In order to improve ourselves is determined not only by our efforts but by the type of guidance we receive to move in a positive, empowered direction. A teacher, mentor, adviser, role model, other allies can enlighten us and point the way, but we ultimately choose how we are living by the day to day decisions we make. Sometimes we have a difficult choice in deciding what is best for us and when we are uncertain that's when we should seek out that necessary guidance. We all go through natural phases in life, and we decide who and where we get help from based on our experiences. I started with positive affirmations to reinforce a positive state of mind and realized that without action I wasn’t going to see results. According to the holy scriptures, "Faith without works is dead". I started to practice meditation to build mental discipline and to focus my thoughts and attention. My life wasn't as great as I thought it should be, and was looking for answers. 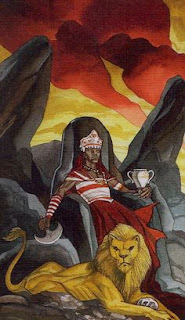 I got the necessary edge I needed within the Lukumi Tradition also known as Santería, Regla de Ochá. The magical component that exist within Santeria lead me to the similar magical practices of Hoodoo. Magic is "the science and art of causing change to occur in conformity with the will" (Aliester Crowley). Magic to me is like Metaphysics which means beyond the physical and also the science behind the building blocks of matter which is made of single particles called atoms and is any substance that has either mass or volume. Matter can exist in three states, either as a solid, a liquid, or a gas. Magic involves the use of energy to cause a chemical reaction and create physical changes in a substance. Energy follows thought and as a man thinketh in his heart, so is he. The occultist uses theses concepts to alter positive or negative situations to manifest a certain condition. The science of magic are Sympathetic Magick- A theory which holds that ‘invisible bonds connect all things’. Homeopathic Magick holds that “like attracts like.” Contagious Magick holds that “things once in contact with one another continue to exert an influence on one another after they have been separated.” Moses, for example, called upon miracle after miracle to keep the people together during their wanderings in the desert. Jesus was even accused of practicing magic, Tribal shamans and priest used natural science to perform their miracles, and practiced some form of religious, ceremonial, folk magic, so if you believe in magic and are looking for spiritual guidance to bring in a positive change in your life don't hesitate to retain my services to help you with your life situation.